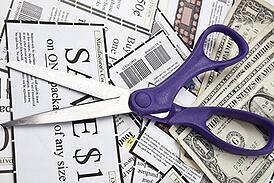 You've no doubt read the glowing success stories of people who practice "extreme couponing." They boast about getting a week's worth of groceries for their family of five and paying only 57 cents. Sure, it sounds great, but who wants to spend all their free time chasing coupons? Couponing doesn't have to become a part-time job. Here are some great tips to help apartment residents save money that don't cost a lot of time. You WILL have wasted your time if coupons languish in a drawer until well past their expiration date. Find a quick and easy organizing solution that works for you. There are pouches designed expressly for storing coupons, or you could use any type of envelope-sized accordion file. Sorting them by expiration date is probably the most efficient method, but you may prefer another criteria, such as item category. Almost all grocery stores and drugstores offer some form of loyalty program that allows you to automatically receive discounts when you check out using your membership card. Many of them also publish coupons on their website that can be uploaded to your card with a click of your mouse. Sometimes you can find perks that let you save more than a coupon's face value. Some stores offer double coupons, either as standard policy or during certain time periods. Others allow "stacking," which means using both a store coupon and a manufacturer coupon on a single item, while some accept coupons from competitors. With Couponing 101, you can plug in the name of an item and search for a corresponding coupon in their database containing thousands of entries. If you shop online, download the free add-on from Coupons at Checkout. It automatically finds available discount codes for items purchased online from thousands of stores including Target, Macy's and Nike. You might be tempted by a $1.00-off coupon for coffee, but you're a devoted tea drinker. A coupon is truly a savings only when it's for a product that you actually use. Have you ever had an exceptionally good score using coupons? Share your story in the comments!